This first time client contacted me looking for a logo. Their concept was alternative baby clothing – something a bit edgier than what you can normally find in stores. They wanted their logo to incorporate that idea, while also still being cute enough for babies and also have a timeless feel. The retro futuristic 50’s look got them most of the way, and incorporating a jack and fun colors finished the logo. 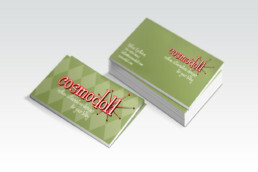 Besides the logo, I also worked on business cards, invoices and digital assets for them.